In her research upon graduating from her undergraduate program, Grace McDonald, Assistant Director of Nursing at Bethesda Meadow learned that Bethesda had been named a “Best Place to Work” in St. Louis. She applied for a Nurse Manager job right away and soon visited with the staff. From her first visit, Grace knew it was the place for her. Grace’s passion for Bethesda, its residents and staff, has led to important innovations and significant recognition. Grace received the 2015 Joan Anne McHugh Award for Leadership in Long-Term Care Nursing from LeadingAge, the association of more than 6,000 members and partners (including Bethesda) who represent the field of aging services with the goal of expanding the world of possibilities for aging. She also received the Employee of the Year– Direct Care Award from LeadingAge Missouri, the organization’s state partner. According to LeadingAge, those who nominated Grace for the awards described her as “truly exceptional.” Staff members said she goes above and beyond the expectations to enhance the quality of life for residents. In her previous role as nurse manager, Grace worked with the administration to make the Memory Support neighborhood feel like home. She provided her staff of 20 with activity materials for the 26 Memory support residents—all of whom have Alzheimer’s disease or another type of dementia. She took extra time to pamper residents by doing their hair or makeup, and she has even adopted a dog for the neighborhood. Much of what she did was outside the realm of her responsibilities. 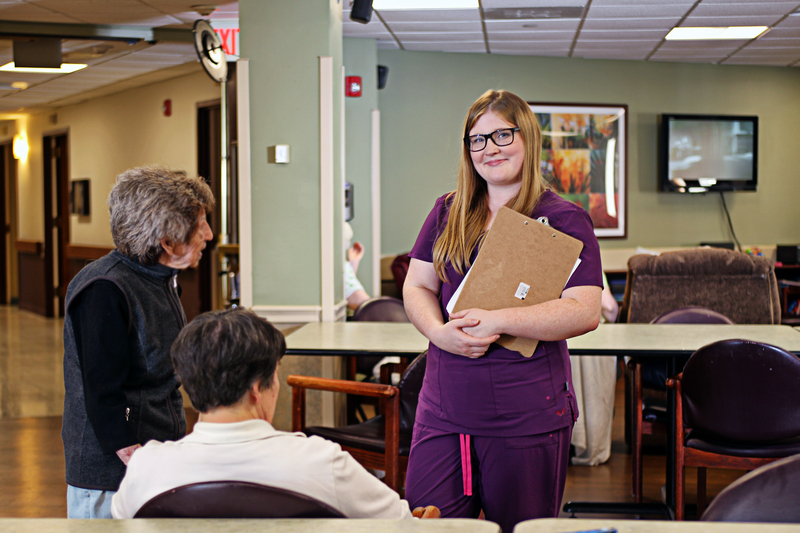 “Grace is a great role model for her staff and her fellow management team members,” says Sarah Arnold, Director of Nursing at Bethesda Meadow. Grace says one of her favorite parts of the job is identifying new solutions based on practice evidence. From her research, she learned that reducing psychotropic medications for Memory Support patients was an emerging best practice, so she worked to begin implementing this solution at Bethesda. “When you give someone a medication for a behavior, you’re basically putting on a Band-Aid,” she says. “You may not really be addressing the root cause.” Grace believes that digging a little deeper and “reading between the lines” when working with residents is key to finding problems. She said it is important to pay attention to patterns in residents’ everyday habits—like nervousness or constantly feeling cold—as well as to the stories and information family members provide upon admission to the community. “Sometimes there’s more beneath the surface, and these are clues to the root of an overarching problem,” she says. For Grace, collaboration is key. She says her main strategy in creating change has been to lead by example and let the results speak for themselves. Grace says the supervisors at Bethesda have taken keen interest in the professional development of their staff and that their efforts have helped her immensely. “Sarah Arnold makes me feel like I can succeed and build a career here,” she says. Grace is pursuing her master’s degree and hopes to continue advancing her career with Bethesda. She says her passion for building a “home” for the residents motivates her to continue working hard. “When you see what a difference you can make—when residents are able to share moments with their families they wouldn’t otherwise have been able to share—it really makes everything worth it,” she says.